The above photo really doesn’t show how awesome this dress is; I rarely wear black but this one manages to be comfortably modest yet feminine and flattering. I wore a pair of dark low heels with it. 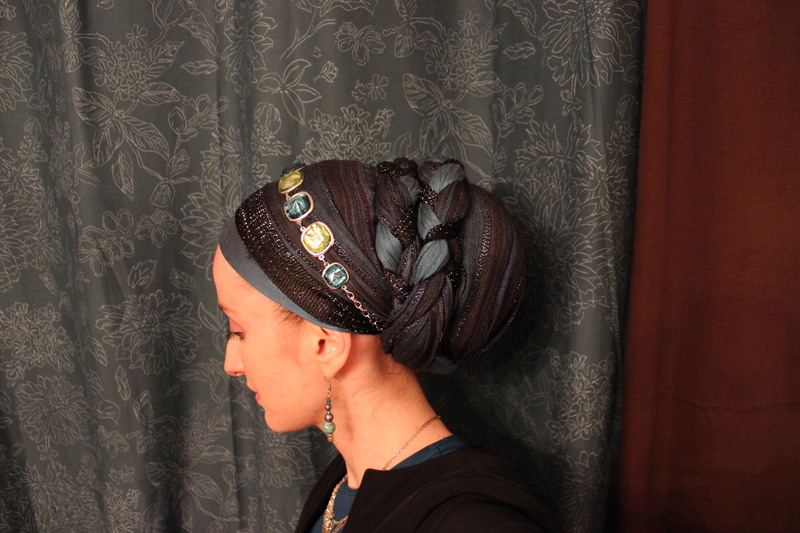 And [drumroll] here is a closeup of the tichel! I am really loving loving LOVING the double twist braid lately! And I have a pretty wacky idea of an extreme variation on it which I’m gonna try tomorrow… stay tuned!! But about this wrap: it’s incredible how similar colour families can make an intricate wrap much more subdued. Of course, if the occasion were more business-y the headband necklace wouldn’t have been included… but this was for a wedding! Yael; our awe-inspiring Lady Wrap Star! I almost can’t find the words to introduce this woman… she is just so full of light and love! What an inspiration! My name is Yael, and I am originally from Chicago. My husband Effie and I live in Atlanta where we are involved in an incredible Jewish community and synagogue, The Kehilla (http://thekehilla.org/). My husband and I met there, and it is just a beautiful and supportive group of people from all walks of life committed to Judaism. Professionally, I am a Director of Teaching and Learning for Teach For America in Metro Atlanta, and I absolutely love my job! When I first joined Teach For America back in 2008, I taught third grade in Miami. I am very passionate about and devoted to working towards educational equity in this country. Through my current role with Teach For America I plan professional development for our elementary teachers and support them in the classroom. I also design many of our large events and some of our diversity and inclusiveness programming. I work in a variety of settings, such as the Teach For America office, coffee shops, and public schools spanning four districts. No matter where my job takes me, I go with a smile and a hair covering. Covering my hair in many contexts has allowed me to explore and share a totally new part of my Jewish identity with teachers and co-workers. This has been the springboard for deeper conversations with colleagues about my Jewish identity and its relationship to the social justice work that we do. When I wrap my hair I feel elegant, beautiful, creative, and proud. It becomes a medium for me to express who I am. Wrapping gives me a sense of connection to Jewish women throughout history. My tichel is my crown and, in a way, my wedding ring. It signifies my commitment to building a Jewish home. Further, it serves as a way to outwardly show my Judaism and demonstrate the beauty in our Jewish culture. I have been covering to some extent since I got married just over a year ago in November 2012. Before I got married, I was not quite sure how I was going to cover my hair and if I was going to cover my hair full time. The day after our wedding I decided to try it out by wearing a hat. That night for sheva brachos, I wore a scarf. I decided after that day that I could do this! I wore mainly hats and some scarves covering my head for the first couple of months. Over time, I transitioned to pretty much covering all of my hair with scarves. And I do have fun mixing it up! 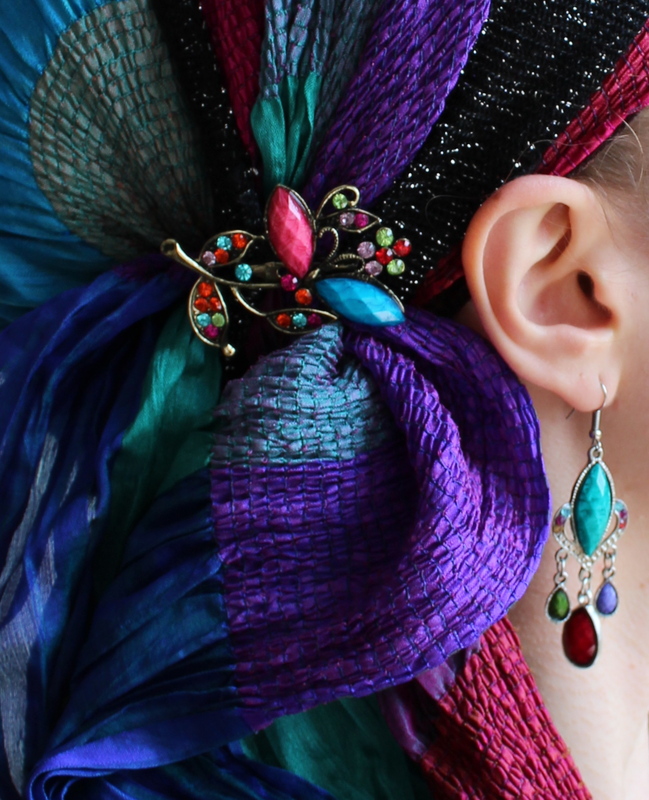 I have a fabulous collection of scarves and hats (and of course accessories like headbands!). I also have worn a sheitel a couple of times, but wrapping is my absolute favorite way of covering. When I wrap my hair, I feel like the best version of myself. My twin sister Ilana is one of my wrapping role models. She has been covering her hair since she got married in 2010. Being a twin is AWESOME because you share everything, and now we get to share tichels and hair wrapping techniques. We live in different cities, but when we visit each other we always do a mini tichel swap. We also regularly send pictures to one another to share our daily looks. Having a twin along for this hair covering ride has been special for both of us. My friends and family have been incredibly supportive of my decision to cover my hair. Before getting married, my friends in Atlanta threw me a meaningful tichel party with demonstrations and beautiful divrei torah about the significance of hair covering. A couple of weeks later in Chicago, my friends and family also threw me a tichel party. At this party, everyone, Jewish and non-Jewish, those who cover their hair and those who do not, all tried on hats and tichels with me. Insignificant as this might seem, the participation of my friends and family in this way affirmed their support and gave me the strength that would eventually allow me to cover my hair the way I do today. Wow! Check out Yael’s rockin’ tichels! This girl can wrap! Hi Wrapunzelers! I’m happy to introduce you to Rebecca, a woman who proudly wears her tichels in the workplace and writes about her experiences! Here is what she has to say to us Wrapunzel ladies about herself… let’s give her a warm welcome! I’m Rebecca, and I’ve been covering my hair since I got married about for about four and a half months ago. When I was engaged, I put a lot of time and effort into researching how and why I was going to cover my hair. I wanted the mitzvah to be meaningful and something I connected with. I really enjoyed reading the book Hide and Seek: Jewish Women and Hair Covering by Lynne Schreiber. I recommend this book to anyone who is considering covering their hair for Jewish reasons. While I was engaged, I took a trip to a sheitel store and tried on a few wigs, but I just didn’t connect to the wig. So hats, scarves, and tichels it was! 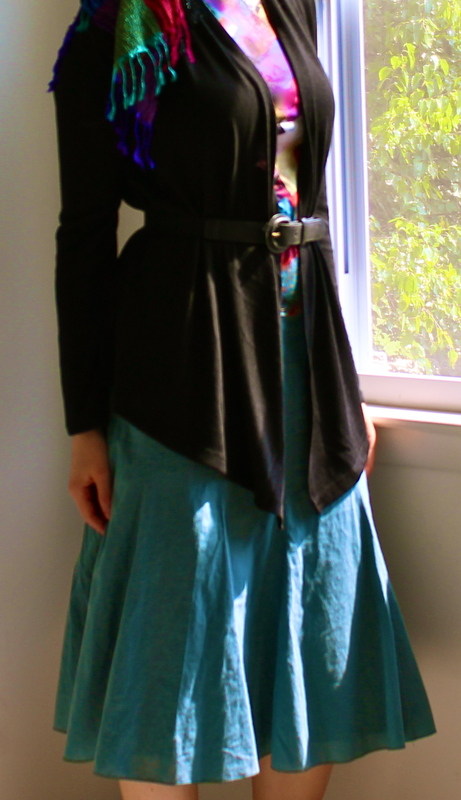 I have a lot of fun covering my hair and matching my coverings to my outfits. And my collection of hair coverings keeps growing! As times goes on, I’m getting better at adding accessories, like hair pins and earrings. I’m still working on getting more of the elaborate tichels and wraps to stay on my head all day without having to re-adjust! I work as a school psychologist at a public high school with essentially no Jewish community. I had worked at my job for about two years before I got married and covering my hair. So, when I started covering my hair, it was very obvious. I get a lot of questions, comments, and remarks from co-workers and the students I work with. And the remarks are overwhelmingly positive! I get comments saying how classy I look, and I get into meaningful discussions about the Jewish concept of marriage. Now that I’ve started covering my hair, most of the people I work with know that I’m Jewish. I look at this as an opportunity to be a Kiddush Hashem; to be a positive example for the Jewish people. 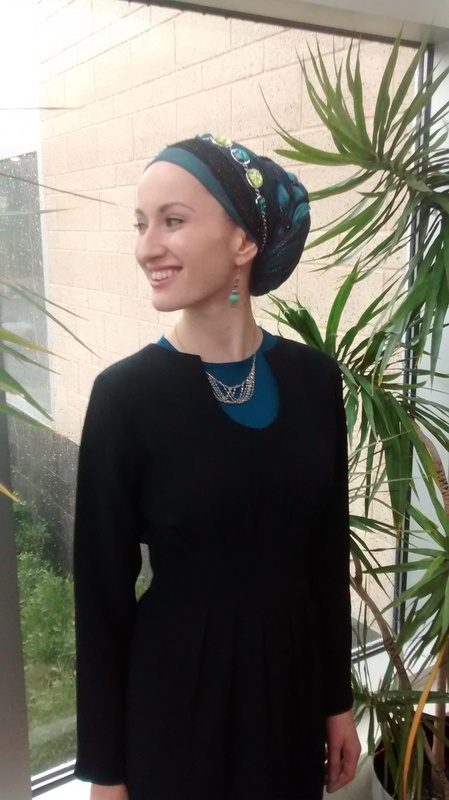 Because all of my friends and family enjoyed the stories I told them about the comments I get about covering my hair and being Jewish at work, I started a blog. It’s called Jew In The School: The Adventures of the Tichel-Wearing School Psychologist. You can follow me on Facebook and read the blog too! I must say, that as much as I love wearing lots of colour, I do enjoy my basic blacks! The ease and elegance of it is simply unmatched. That being said, I wanted to wear black today and be colourful as well! Here’s is a post about how I went about being colourful and wearing black too! I enjoyed what I wore today very much. The colour was joyful, the silhouette was feminine yet comfortable, and the black was pulled together. Shana tova! Now tell us, what are some new combinations/experiments you have tried lately, and how did it go?